The third Heathrow runway would be a mistake of gigantic proportions. I can categorically say that the building of another runway at Heathrow would be about the most stupid and unpleasant political act you could imagine in this day and age. There was a full Royal Commission in 1968 which completed the most comprehensive study of its kind and recommended a site for a new Third London Airport. The question of increasing the capacity of existing airports was raised at that time but rejected on both cost and operational grounds. Stansted was considered by the Commission but rejected early on for various environmental, technical and access reasons. I have the reports of the Roskill Commission before me now, for though the numbers are out of date the problems are the same and the solution is evident. At that time the great issues were aircraft noise and pollution, since all the aircraft using Heathrow had to fly over London, as they still do. This has been a recurring complaint, and seems to have been conveniently forgotten by those advising the present government. But there is much more and a bit of my history is needed. In 1967 I was appointed the first Economic Adviser on aviation to the British Government. In those days civil aviation came under the Board of Trade. Almost the first task I had was to review the recently announced decision to make Stansted the Third London Airport. I proposed that the best tool for such a decision would be a comprehensive cost benefit analysis. So I was asked to undertake the very first rough and ready cost benefit analysis of an airport location. I worked under Professor John Heath, then Head of the Board of Trade Economic Unit and we had copious advice from Christopher Foster and Michael Beesley, who had been pioneers in cost benefit by using it to justify the investment in the new Victoria Underground Line in 1964. I still have a copy of that rudimentary Cost Benefit and it showed conclusively that the designating of Stansted was a bad mistake. It turned out that the only real justification that the Airports Committee had for naming Stansted was the existence of a very long runway built by the Americans in wartime, and actually pointing in a sub optimal direction. It was immediately clear that Stansted would be wrong because it was too far from the markets that it would be designed to serve. John Heath took my disquieting calculations to the then President of the Board of Trade who was Anthony Crosland. He quickly saw that there was a serious problem in identifying all the factors concerned with the location of airports. He immediately commissioned a rather more comprehensive review of the decision which was put on hold. Out of that came the decision to mount a full-scale Royal Commission to investigate both the location and the timing of the building of a Third London airport. The commission was under the chairmanship of a High Court Judge, Mr Justice Roskill, and included a number of the most eminent experts on planning, economics and transport. In order to guide the newly appointed commission, John Heath and I wrote a methodology paper recommending that a full-scale cost benefit analysis should be used to help the commission determine both the best location and the ultimate timing of the construction of a new four runway airport for London. This was intended to replace existing runways around London, of which there were actually at that time more than seven. The Commission accepted our proposal and a large research team set to work on probably the most comprehensive cost benefit ever. The Roskill Commission Reported: the Government Acted. Three years later the Roskill commission reported, recommending the building of the new airport on the outskirts of Milton Keynes at Nuthampstead. This was by far the most efficient place since it lay on the long established transport spine from London to Birmingham. It also proved the most economical for air traffic control and had a ready-made city for workers in Milton Keynes. The only snag was that it is also a most charming stretch of country beloved of ramblers and fox hunters. There was an immediate outcry and protests. One member of the commission, Prof Colin Buchanan disagreed with the recommendation and personally recommended the building of a new airport and city in the Thames Estuary centred on Foulness Island, which later became known as Maplin. This site had been on the Commission’s short list but was considered too expensive and poor on user access. I was still in post in the Board of Trade at that time and therefore advised ministers and the Cabinet on the response to this huge and ground-breaking exercise. In the event the new Prime Minister, Edward Heath, and his Cabinet decided to go for Colin Buchanan’s recommendation and commissioned a new airport on Foulness to be known as Maplin. A unique position and knowledge. So I am in a position to have been both instrumental in promoting a remarkable planning study, locating the new airport and also the politics behind it, and was involved in the subsequent decision. There is probably nobody alive today with as much knowledge as I have about this issue. In those days the airports of London were under the management of the British Airports Authority which was charged with building and commissioning the new airport at Maplin. In 1974 the government changed again and Harold Wilson became Prime Minister and I found myself this time working in Downing Street as a Policy Adviser. I was visited by Sir Norman Payne who, by then, was the chairman of the BAA , who lobbied me to advise that the Maplin project should be abandoned. He had two reasons. Firstly the cost was far more than the original estimates, since nobody had taken account of the fact that there was nowhere for the 200,000 staff, who would work at the airport, to live in that part of Essex, and a new city would have to be built plus a supporting infrastructure. The other reason was that the growth in air traffic had actually been much slower than we’d forecast and such a facility would not be needed until the mid-1990s at the earliest. In the meantime, the BAA were prepared to develop Stansted, particularly aimed at the tourist and holiday market. I have to admit that, with considerable reluctance, I brought this point of view to the Prime Minister’s attention and the Minister of Transport who by now had charge of civil aviation policy. Everybody will remember the severe financial crisis in 1975, and this was a useful ‘get out’ for the government and so, sadly, Maplin was first postponed and then abandoned, like a lot of major infrastructure projects, including the National Road Programme. Such decisions taken for industrial and financial reasons have since come back to haunt us. Investment was put into Stansted and Gatwick, and also a certain amount into Heathrow itself, with the building and commissioning of Terminal Four on the south side. For various technical reasons the capacities of the airports, in terms of aircraft movements, were slightly increased and, in order to spread the load around the different airports the BAA decided to impose differential landing fees on the airlines. This meant that those using Heathrow, which was predominantly British Airways, would pay very much more than those using the other airports. This was a pure economic response, to use the price mechanism to redistribute the use of a scarce resource. It was hated by the smaller and less profitable airlines, and it was further reinforced by moving airlines, particularly from small and less important countries, out of Heathrow and into Gatwick. However, British Airways did work hard to improve and increase its use of Gatwick, and there was British Caledonian operating out of Gatwick as well, and so a network began to develop based on that airport. Time moved on, and the new government under Margaret Thatcher determined to rid the state of its various enterprises, and so the BAA was targeted to become a privatised entity. As part of this process, and somewhere along the line, the result of fierce lobbying from various parts of the world, the differentials of the landing fees were whittled away and eventually, by 1988, abandoned altogether. Then there was also the demise of British Caledonian and Dan-air, absorbed into British Airways, which destroyed the basis of an international network at Gatwick. The budget airlines and single-point tourist services. The rise of the budget airlines, one based at Gatwick and one based at Stansted, has taken most of the short haul business away from British Airways, but has also meant that Stansted and Gatwick have become terminal airports with very little interline business. With great relief the various minor national carriers have returned to Heathrow. In fact, Heathrow is the only fully functioning interline airport in the south of England, since Luton and Southampton do not have interline networks either. So the real problem is that Great Britain has no strategic policy on airports and has taken some very bad decisions over the years. The most striking thing is that when we really have proper investigation, we find that there are policy options which are cost effective and environmentally appropriate. However, we then give in to the London ‘establishment’ that is so in love with LHR that it will bend the facts and twist the arguments to support yet more investment in Heathrow. It is gratifying that the work done to justify the decision to recommend the building of a third runway has been published. The reports show clearly one of the great problems with cost benefit analysis. As one of the originators of the technique, I am in a special position to be critical. Cost benefit is a way of looking forward to judge the worth of a current investment into the future. It depends on a body of forecasts and assumptions. Variations and biases in these will nullify results. So, cost benefit is good at deciding whether to undertake a particular project, but it cannot be trusted to confirm a choice between alternatives. In the end, the Roskill Commission probably chose the right site, but Professor Buchannan was probably wiser and more in tune with the national mood than his contemporaries. Airport Capacity: The Recent Studies. The work done on Airport Capacity in the South East merely tells us of the need and offers viable options. The differences between the alternatives are well within normal error and so the actual choice falls back to the usual suspects. In the end our politicians have to balance out the loss of Colnbrook, Harmondsworth and Poyle and a charming stretch of the Colne Valley, not to mention yet more noise and pollution over London against peace and quiet over open country behind the South Downs. We need leaders who are brave enough to face down the establishment’s love affair with Heathrow and build a runway at Gatwick. I have a strategy for making this economically viable at the end of this piece. The (Chartered Institute of Logistics and Transport) Focus Magazine Article. So now I must turn to this latest nonsense justifying a third Heathrow runway. It just amounts to a mish mash of opinions and pleadings reproduced in Focus, the journal of the Chartered Institute of Transport and Logistics of which I am a fellow. The article (A Third Runway at Heathrow. Focus Magazine, July 2018. PDF) is published under the names of Sir Howard Davis and Sir John Armitt, though I am sure it represents the views of many interested parties and the public relations department of British Airways. They start by rehearsing the mantra about Heathrow being big and serving lots of destinations. This is supposed to give Britain a particular commercial strength. Air transport is just transport, like cars and trains. The convenience of Heathrow is mainly of use to travellers, many of whom are merely passing through. Thirty percent of all passenger movements are interlining. This is great for the airlines concerned, but of no economic benefit to the Britain beyond its profit. No data is provided to justify the claim that a huge network available at Heathrow is of material benefit, other than to provide work for West London. But its repetition tends to make us feel good. Actually, more passengers interline at Clapham Junction in one day than do so at Heathrow, and that is not a reason for investment there. Air Transport and International Trade. 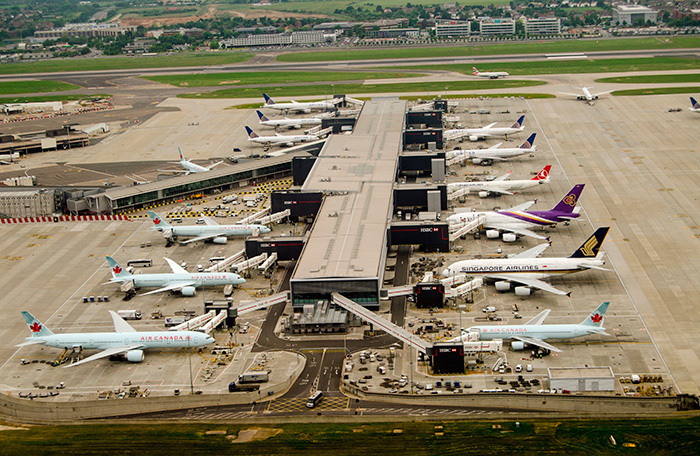 The writers then say that Heathrow’s existence helps with developing, emerging markets. My question is simply, ‘How?’ If we have anything to offer those markets it is more likely to be consultancy, project management and technology. All of which rely more on IT than air travel. I cannot accept the contention that the availability of air services does anything to encourage trade in goods and services. I repeat, it is just transport. The large amount of interline traffic attracted to Heathrow interchange is actually a cost to Britain, though a profit for those involved. It does nothing for our economy. They next tell us that Heathrow is unique as an airport but they do not tell us in what way. The large amount of interline traffic attracted to Heathrow interchange is actually a cost to Britain, though a profit for those involved. It does nothing for our economy. No connection between the size and scope of Heathrow, and Britain’s economic progress has ever been established, it is simply an opinion. It is true that Heathrow has been operating at capacity, but that has to do with two very inconvenient factors. The pricing policy and political pressures have seen the return to Heathrow of many long haul airlines that do not need to be there. Secondly, a huge volume of migrant incomers, and relatives flow through Heathrow, which again does not need a premium airport close to London. Heathrow is valuable, indeed, but its value is dissipated by many services which could go elsewhere. On the other hand, the domestic network has shrunk and is mostly there to support the long haul services. Even that could be reduced by high speed rail connections. The next paragraph made me smile. If ‘other hubs’ want to indulge in interline business then good luck to them. After a lifetime in Civil Aviation I am still amazed that the airlines want to chase interline business which often costs more than it gains unless the airline concerned has a niche to explore. I will explain. British Airways feeds business from America, its biggest overseas market, into its remaining European service to support the cruise liner business, which is dominated by American travellers. This enables it to charge premium fares on routes such as London to Genoa, Barcelona and Lisbon, to the cruisers who need to be sure that their baggage is safe when they interline at Heathrow. We need to be quite clear about the interline business. At present 30% of passenger movements are interline. But because of the way we need to count passengers arriving and departing, and relate those to aircraft movements , these passengers are all counted twice: in and out. Of the 214,000 passenger movements every day, 64,000 never leave the airport. And since they are counted twice, there are only 32,000 actual persons. However, most of those have to spend time in the lounges which make them a wonderful retail opportunity for all the businesses there. The interline business is very useful to the airlines, and most providers of ‘front of house’ activities. But interline at Heathrow is not of long term use to Great Britain. This whole issue of interline also highlights the truth about access to the airport. There are roughly 210,000 people who work at Heathrow, and that does not include flying staff who account for another 45,000. This workforce generates nearly half a million passenger journeys a day using trains, cars and bicycles. The total of passenger movements into, and out of Heathrow each day, at 150,000 is dwarfed by the staff. Even if we add one meeter or greeter for every traveller, that flow is overshadowed by the workers. It follows that a large expansion of Heathrow will place great stress on all the surface transport around Heathrow and require massive investment. And while on the subject of employment, the promoters have suggested that not expanding runways could threaten long term employment prospects. Nobody should take this seriously. This is an employment hot spot already, and increasing attraction will cause serious congestion throughout West London. Our promoters also tell us that Heathrow is the most important freight airport in the UK. As a user of the Heathrow freight terminal quite frequently, I have my doubts about its ability to cope with much more. In fact, it might be argued that there would be great benefit from dispersing the freight movements in pure freight aircraft away from the London area altogether. Certainly the freight traffic at Heathrow simply cannot be used to justify major investment like a third runway. Now we come to the core of the whole argument. Without very substantial investment throughout West London, Heathrow cannot increase its connectivity to London. It is currently connected by a 50 year old elevated motorway long past its sell by date, an Underground line for the use of staff that is perpetually over stressed, and a quick rail service from West London. For the rest it is busses and cars. Almost everything about Heathrow’s access today is insufficient. The airport, looked at as it is now is, makes the idea that there would magically and suddenly be better connectivity, a dream. Most of the arguments concerning the new runway completely ignore the fact that the airport is now so badly connected to London itself, and the wider country, that large scale major investment, way beyond what is now needed, would be necessary to support the new runway. The next paragraph in the Focus article verges on the ridiculous. We must ask ourselves why we would want to build a new runway, the use of which is immediately limited by noise and environmental regulations. The ‘balanced package‘ is nonsense. I would refer everyone to the Roskill calculations on aircraft noise and, although aircraft are significantly quieter than they used to be, as I sit here in my study I can hear the planes overhead and they will go on all day long. Can the people of West London possibly be persuaded that putting another runway in will make this any better? There is an overriding nonsense, too. The writers have committed themselves to an indefinite night-time curfew, this means that the investment is going to be underutilised. The destruction of the area between the airport and Windsor is not something that should be entered into lightly. Not only are they going to wipe out a chunk of the Thames Valley for all time, but the disruption concerned will go on for at least a decade. So the environmental costs of a third runway are right up front and not to be discounted ‘in the long-term’. The final peroration of Focus Magazine’s article is that expanding Heathrow will in some way benefit the whole of Britain. This is specious nonsense because the real reason why the London establishment wants to expand Heathrow, rather than mitigate the present disturbance and disruption, is because they like it to be just a taxi ride away from their offices and they are irritated by the delays that have resulted from a lack of policy and the resulting congestion. the real reason why the London establishment wants to expand Heathrow…is because they like it to be just a taxi ride away from their offices and they are irritated by the delays that have resulted from a lack of policy and the resulting congestion. There is no data to confirm that size and popularity of the major airport brings any extra prosperity. It may just be that ‘big’ is costly rather than ‘adequate’. The size and distribution of airliners, both now, and in the future, is almost entirely irrelevant. The one thing I can say about the Roskill commission traffic forecasts is that they were wrong. In fact, we were wrong by 20 years. We believed that the London area would flood with aircraft and be unable to function after 1985. As I show below, not only were we hugely wrong, but there is a good reason why we were, which had nothing to do with the size of aircraft, which has hardly changed since the 1970s. In those days we did all our forecasting on the basis that the load factor (that is, the proportion of seats actually occupied on average in an aircraft) for short haul operations was about 60%, and long haul operations about 54%. The reason for these figures was that the airlines charged published fares, and people do not present themselves for flights in convenient aircraft sized groups. Through the days of the week, and the hours of the day, the number of passengers available on any given route will vary, and if the airline is to operate regular timetabled service, it has to fly a fixed schedule with aircraft of fixed size, frequently when there are insufficient passengers. This was tolerated all the way through my early days in civil aviation. And when we did the forecasts, even as late as the end of the 1970s, we were still assuming that this was an immutable fact of life. It isn’t any more. As Chief Economist at British airways I produced the first multi fare scheme – three classes, then four, and so on.. It was very crude. But now, with almost instantly variable pricing, and the benefit of the most sophisticated algorithms built into their booking computers, airlines are able to vary the price of a given seat almost all the time. If a certain service is not booking, they lower the price. But if there is overbooking they will raise the price and reduce demand. This may mean they sometimes move the price while the customer is in the process of booking. All this sophistication of the sales effort has meant that the average load factor of short haul operations is now more than 85% and the average load factor for long haul is just under 80%. Of course there is still plenty of aircraft flying with empty seats, but those will tend to be for airlines that don’t have the facilities to vary their prices at will. But all the large airlines apply the same sort of algorithms. This change in the ratio of passengers to aircraft is absolutely fundamental, and explains, more than anything else, how Heathrow has managed to survive through to the present day when we thought it would seize up by around 1985. The application of pricing algorithms means that the same aircraft are now carrying on average 40% more passengers than they did in 1980 . This completely altered ratio of passengers to aircraft means that the 214,000 passengers a day go through Heathrow occupy the same number of aircraft movements as the 130,000 that used to go through Heathrow in a day. We shall not see a future where aircraft are almost all full, so this gain in the capacity of aircraft is now history. There will be some increase in the average size of aircraft, which will probably add about 10% to the capacity of the airport. Much more interesting than the aircraft size and capacity, is the way that airlines are deploying their fleets. Having complete control of the selling operation and its pricing means that passengers can be tempted on to flights at inconvenient times for a discount. In my day we couldn’t really move anybody at Heathrow before 0830 in the morning. Now we are moving people out as early as 0630. If we extend the day, that is one way which we can increase the capacity of a London runway. But the Heathrow third is condemned to close at night! The following paragraph in the Focus Magazine article, about the effect on regional airports, is really a motherhood. Regional airports will continue to thrive just as far as the passenger demand in those areas exists. As far as one can tell, leisure passengers from these airports prefer direct services, and anything which encourages the growth of such services will be welcomed in the regions. The killer argument against a third runway at Heathrow is that it will not increase the capacity of Heathrow by 50% . Currently, Heathrow operates at 74 air transport movements an hour on the two runways, for nineteen hours a day, from five in the morning, until midnight. That sets the limit of what is possible. It does also mean that, if they operate at that intensity, they do so with an increasing prospect of there being disruptions, because of the basic rules of air traffic control: that two aircraft cannot be committed to the same piece of concrete or the same airspace at the same time. The third runway could only, at best, produce 22 to 24 more movements an hour, and with risks. It cannot be built any closer than 800 metres, and maybe more, from the northern runway. Even then, there will be serious operational problems. The link taxiways that would be required for an aircraft that lands to the west, on runway three, and needs to take its passengers to Terminal Four, will have to taxi after landing for nearly 20 minutes. As anybody who has recently visited Barcelona knows, they have a similar situation with their new runway, nearly 2 kilometres from the terminals that it serves, and that adds time.. In conclusion, I would argue that the evidence for building this monstrous construction in west London is so thin as to be blown away by the acquisition of some serious facts. Perhaps the most telling is that the growth in air transport is most decidedly slowing. Flying is an expensive activity, and the huge growth of civil aviation was not only because the aircraft themselves became more efficient, but the builders became more efficient at making them. I have researched and published in this area, and am perfectly sure that the downward trend of all airline costs has come to an end. There is nothing to be had from exotic means of travel involving very high speed or electricity or whatever. The technology of flying has been with us for a century now, and it won’t get any cheaper. And, because it won’t get any cheaper, the number of people able to fly will stabilise. I was responsible for the forecasts that underpinned the Roskill Commission. I can assert that every single forecast since then has overestimated the future demands for air transport. We need to adopt a policy of working as far as possible within the existing range our facilities, not building new ones we may never need. There is one further observation that I would make. Soon after the industry abandoned Maplin, the BAA built Terminal Four. That terminal was originally my idea. I was then working in British Airways and was charged with launching shuttle services to Glasgow, Edinburgh and Paris. We envisaged a new terminal on the south side, on the site of the Air India kitchens. This would be a new kind of terminal which would incorporate car parks, check-in, luggage and boarding in a single operation. We even had designs commissioned. This is a dream that never came to pass because the BAA preferred to make the new building another all-purpose terminal which, for many years, was used by British Airways. Then it was determined that there should be a Terminal Five. This was argued over eight years of public enquiries from 1995, the longest in history. I gave evidence that there was no need. My view that it was not justified on growth reasons was overruled. Terminal five opened in 2008, and British Airways moved from Terminal Four into this new terminal, and Four was then substantially renovated for long haul services. Then Terminal 2 was demolished and a new Terminal Two opened in 2014. Apparently, this is just a half terminal, with the rest of it being built on the site of former Terminal One, which is to be demolished. The point is that, in spite of thirty years of construction, there are still only four terminals, and Heathrow operates perfectly well. Hardly record breaking growth! What is clear is that the airports 200,000 passengers in and out per day has taken 30 years longer to arrive than we forecast in 1969. Passenger movements at Gatwick and Stansted have begun to decline. Similar overstatements were made about employment, but not so dramatic. What is clear is that all forecasts of airline traffic and associated activities have been wrong and over optimistic for all of the last four decades. It would be folly to embark on a mega expensive project when we probably have enough capacity already at a quarter of the price. Having consulted the Roskill Commission report extensively in writing this article, it will be no surprise that my sympathies lie with new construction. After we had decided not to build Maplin in 1976, there was no appetite for proposing such a major scheme because the traffic simply did not warrant it. But somebody else was planning exactly that. The creation of a new island to build an international airport was proposed, financed, and built in Hong Kong. The new Hong Kong airport with a new city alongside it; motorways. suspension bridges, high-speed railway lines, and everything else, is an absolute wonder. They did something that we could have had with the courage to build an airport by the sea. A second runway at Gatwick, on the south side, would cost a fraction of the third runway at Heathrow.Â And on the south side it would not cause major disturbance to Horley and Redhill. There is, however, an obvious opportunity for a runway to spread the load, and change the way we operate the London area. A site that has the advantage of being adjacent to a major airport, but separate enough to be built without major disturbance to the existing operation. A second runway at Gatwick, on the south side, would cost a fraction of the third runway at Heathrow. And on the south side it would not cause major disturbance to Horley and Redhill. Admittedly, nobody in Sussex wants another runway, but in terms of the utility of the nation as a whole, they may have to put up with it, as long as they are compensated generously. A second runway at Gatwick, and major development to the access rail and road, would be a really creative and important investment. A new runway would require a new terminal, as well as the availability of a great deal of new housing in the surrounding towns. A second runway at Gatwick South ticks all the boxes, and could settle the matter for a couple of decades. Like all good economists, I have a proposal to alleviate the present congestion at Heathrow. The composition of the passenger traffic at Heathrow now suggests that only one third are on business (defined as somebody else paying the fare). The rest of the traffic, though, is responsive to prices, and so Heathrow should be developed and promoted as the Premium Airport, and should charge accordingly. We should, again, use the price mechanism to allocate the runway slots more equitably. The Department of Transport should introduce a surtax on landing fees at Heathrow. It should then use those funds to pay the users of Gatwick, Stansted, and Luton a subsidy. There will be screams of horror from the industry, but enough movement to the other airports to make more runways less urgent in the short term. Perhaps the most upsetting aspect of this whole affair is that officials at the Department of Transport support the expansion of capacity at Heathrow. We Londoners live with the constant noise of aircraft, the resulting pollution, not to mention remote possibility of accidents. What other great city would tolerate this . And we are expected to welcome an increase in the nuisance. Somehow I do not think so….